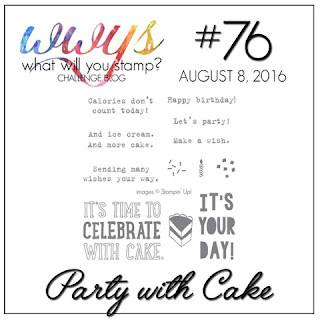 Hey everybody and welcome to this week's What Will You Stamp Challenge! This week we have been challenged to use a super fun set called Party With Cake! You may not know this about me but I absolutely love fonts that look they are from an old school typewriter-yep, really! So, it makes sense that I would love all of the fantastic sentiments in this set because the font is awesome! 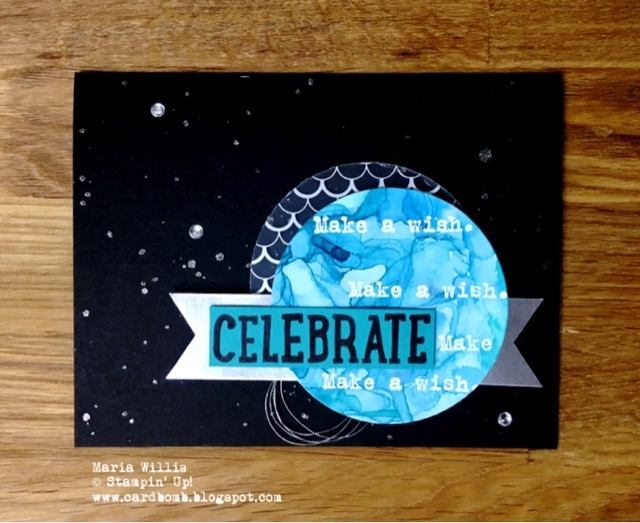 I decided to use the "Make a Wish" sentiment to make a fun background centerpiece for my card. After watercoloring the background I heat embossed my sentiment multiple times in white. Then I cut it out using a 2" Circle Punch. I used the Layering Circle Framelits to cut out a piece of one of the sheets of Fabulous Foil Designer Acetate sheets to tuck behind my sentiment circle. If you haven't gotten your hands on this acetate yet I've gotta tell you it's pretty amazing! Every sheet has beautiful designs and one side has gold designs and the other side has silver. I've placed mine with the silver side up on this card. After layering the two circles I added a silver foil banner and some silver metallic thread to the mix. Then I stamped the "Celebrate" onto a piece of Bermuda Bay and stacked that right on top of it all using dimensionals. I wanted to add just a little more to the background so I splattered my Basic Black card base with Clear Wink of Stella and added just a few Silver Metallic Enamel Shapes to add some more sparkle and texture. I love how this came out and I sure hope it makes someone happy on their birthday! Here's a look at the whole Party With Cake stamp set. I only used one and a third stamps on my card today but the rest of the stamps are all really great too! 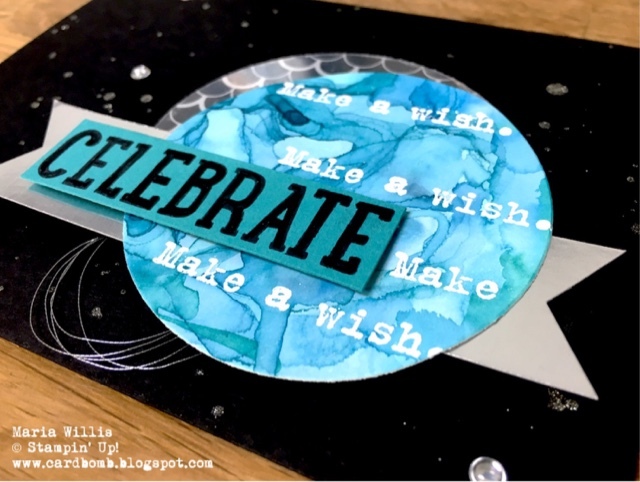 If you'd like to see more inspiration using this set please head on over to the What Will You Stamp Challenge Blog to see what the rest of the design team has come up with today. If you have this set and want to play along with us-Please do! We can't wait to see what you will make and be inspired by your creations too. Remember that each week we pick a winner who will have the opportunity to be a guest designer on a future challenge... It could be you! Well, that's it for today folks. Thanks for making my day by stopping by! See you again soon! Labels: #cardbomb, #cards, #create, #diy, #helpingmegrow #stamps, #papercrafting, #stampinup, #whatwillyoustamp, Cardbomb, Maria Willis www.cardbomb.blogspot.com #stampinup, Stamping' Up! This party with Cake looks so nice. I am sure everything was enjoyable. Anyways, I too would be hosting our first anniversary bash but it is just so hard to find the decent budget friendly party venue in LA. I have started the preparations already and creating the list of the budget spots. I wonder if you could help regarding it.